With the late summer nights starting to draw in, my thoughts are turning to planning my first night time photography trips of the autumn season. With that in mind, now seems a good time to describe a technique I use for metering ambient light for low light landscapes and getting the overall exposure just right. Since I first started shooting night landscapes and star trails a few years back I’ve gradually refined my way of working to the point where most of the guesswork has gone and I can get good repeatable results. 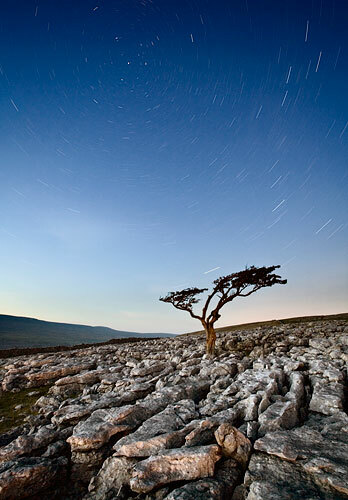 Removing that guesswork is more important than usual in long exposure night landscapes because in contrast with daytime photography, at night you often only get one go at the shot. Bracketing or trying again after looking at the histogram isn’t always possible, not just because of the time taken per shot but also because the light can change so much from exposure to exposure. The technique I’ll describe in this little tutorial uses nothing but the camera’s inbuilt histogram, a quick bit of simple maths (if that bit scares you, I’ve included a quick lookup table at the end of this tutorial) and a bit of rule of thumb that I’ve proven by trial and error to be reliable out in the field. With a little bit of practice it’s a quick, simple and fairly repeatable process. I’m classing this as an ‘intermediate’ level tutorial so I’ll be assuming you’re already familar enough with your camera and it’s settings to take a successful daytime landscape. I’m happy to try to answer queries in the comments if you get stuck though. It’s worth mentioning that I have a fascination with working using the available ambient light and that’s what I’m going to describe here. There are plenty of other techniques such as adding flash and light painting with a torch which can give great results too. However there’s something about revealing the scene pretty much as it naturally is that fascinates me, particularly when shooting using the last light of the day at dusk or the natural light of the moon. In some cases it’s fun to use ambient man-made light that’s already around too but I’ll start here with a dusk shot as an example then have a look at how the same ideas can be applied to other light sources. For my dusk example, I’m going to be using this shot, taken in winter at Hamsterley Forest, in County Durham, after I’d been shooting earlier in the afternoon down at Blackling Hole. My mission here was to capture the scene under the last remaining light as day turned to night. 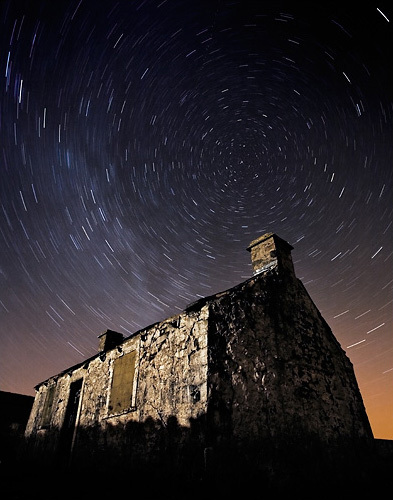 If you can time that just right, you can get a long enough exposure for star trails while still capturing enough light for the foreground, all in a single exposure. And what’s more, that ‘timing just right’ can be judged pretty accurately with some straightforward techniques. The basis of the metering technique is to shoot high ISO, wide aperture images in order to meter the scene, waiting until the ambient dusk light is just right to give the exposure time you’re after. I’m going for a final shot of 10 mins+ at ISO200, f/8 and want to know when the brightness of the scene is right for that, so in essence I need to know how many seconds at ISO6400, f/4 gives an equivalent 10 min exposure at ISO200, f/8 (if you want to skip the maths, see the lookup table at the end of this tutorial). At this point I know that I need a 5s exposure at f/8, ISO200. Here’s my first test shot. At this point it was already pretty dark to the naked eye. I’ve not attempted to focus accurately at this point as I’m just getting a rough idea of what composition I’m heading for and how far I am from the 5s exposure I need. It’s worth being aware that even modern camera metering systems can be inaccurate in very low light and the image on the LCD display can look much brighter than it is when you’re eyes are tuned to the dark. For those reasons it’s vital to check the histogram carefully and either apply exposure compensation or work in manual mode to adjust the exposure until you’re happy. At this point it took 0.5s to correctly expose the image at ISO6400, f/4. 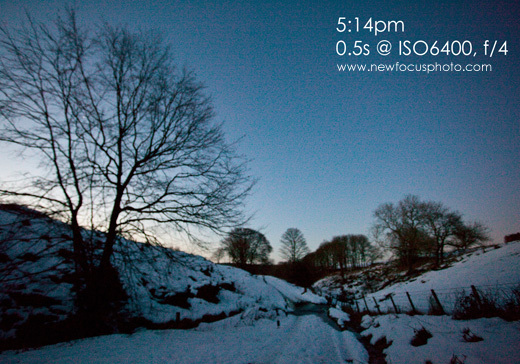 Five minutes after the initial shot, this test shot shows that the exposure time has doubled to 1s. I’ve used the time in between to shoot some more test images to fine tune the composition. Another few minutes and the exposure is now up to 2.5s. If you look back over these three images, you can see that although the overall exposure of the scene is staying pretty constant as the light falls and the shutter time increases, the glow of street lights from the Bishop Auckland and Durham area over the hill to the right is becoming steadily more significant. I’ve adjusted the focus at this point too, ready for the final shot. Finally the exposure time has reached 5s and we’re ready to go. However, there’s a little rule of thumb adjustment that I usually make at this point. If the only significant light source was fairly constant (such as a moon well above the horizon, well after sunset), I’d just go with the 10 minutes as calculated. If the only light was the remnant of daylight though, I would double the exposure time to account for the fact that by the end of the exposure, the light would be much lower. I should add that this doubling works for me here at 54° North in winter. I’ve no experience of whether it works as well at other latitudes but it should at least make a starting point for your own experimentation and refinement. There’s a little bit of judgement to be made if the light in the scene is part constant and part fading. If you don’t get that spot on, you’ll usually still be within the latitude of the digital sensor but it’s worth assessing what’s happening in the scene over a few exposures as the light fades as I’m doing here and making the best judgement you can. This avoids having to push the final exposure around and risking increased noise. In this case I’m going for 16 minutes because of the increasingly obvious glow from over the hill. I’ve included some more examples at the end of this tutorial to help give you a start on developing that judgement on how far to multiply up the calculated exposure. Here’s the final shot at f/8, ISO200 and 16 minutes. 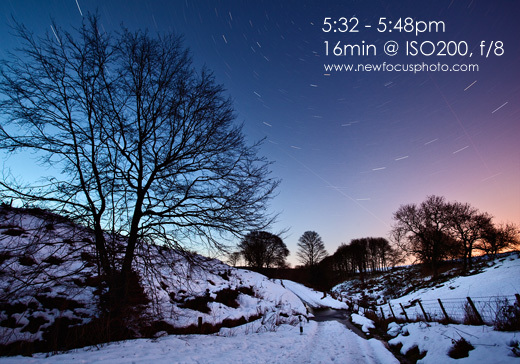 You can see that the glow of the sky to the left has faded further during that 16 minutes and the glow from civilisation to the right has increased. In post processing I’ve applied a neutral density grad effect digitally to balance the sky and ground exposure and fine tuned contrast and saturation, being careful not to push things to far and exaggerate noise. Personally I find physical neutral density grad filters on the camera awkward for night photography, even though I regularly use them in daytime but other techniques such as tone mapping work well enough too. Go ahead and experiment a little to see what works for you. 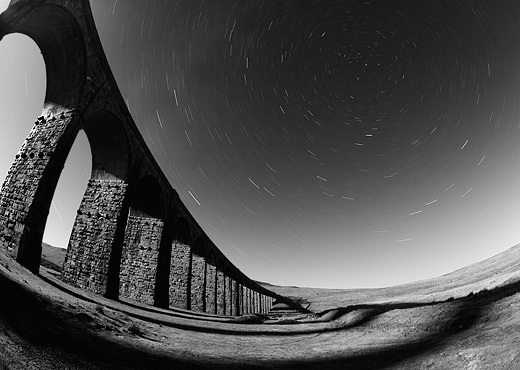 In this shot of Ribblehead Viaduct, I’m shooting well after sunset and the only significant light source is the moon. This is a simpler scenario than the one above since the light is more constant (fairly steady moonlight rather than fading dusk). In this case, the test shot was ISO3200, f/2.8, 10s and the final shot at ISO100, f/5.6 was 10s x 32 x 4 = 1280s (approx 21 minutes). One of my personal favourites is this shot I took of an old building in the Yorkshire Dales. In this case, the foreground light’s provided by occasional passing cars on a nearby road sweeping their headlights across the building. Again, the principle’s the same though. I used high ISO, wide aperture test shots to judge approximately how many cars needed to pass to correctly expose the foreground, then went for the final shot at ISO100, f/5.6. In this shot, the only significant light is that of the fading dusk, so I’ve doubled my original exposure measurement (which would have given 10 minutes) and gone for a 20 minute exposure. 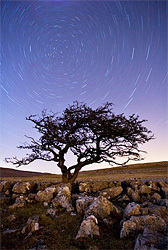 Despite the scene being almost completely dark to the naked eye, the final effect is almost as if the scene is in full daylight, with the star trails just showing through. Hopefully this starts to give you an idea of what’s possible under different conditions. I’m sure there are still further refinements which can be made to this metering technique so if you have any ideas for improvement please feel free to suggest them in the comments and drop in a link if you’ve been shooting your own low light landscapes. I hope you find it useful in the meantime.